At its very basic, potted orchids are most comfortable when you’re comfortable. More specifically, that means they need to be in a room that isn’t too hot and not too cold. Although they do like to be in a bright environment, be sure to keep them out of too much direct light. How often should I water? Potted orchids do thrive a bit when they’re neglected. When its summer, they can be watered as often as once per week. In the winter though, they could be watered a little less frequently (perhaps as little as once every two weeks). How much water? No more than 1/4 cup for a large potted orchid. Its best if the orchid is potted in a plastic container with large drain holes – our come in a plastic pot within a white ceramic pot so any excess water does drain out the bottom of the plastic container and into the ceramic pot. That makes it easy to then pour out any excess water (like all potted plants, orchids do not like sitting in a pool of water). Also, orchids are unique in that they can also take water in ‘through their faces’ or their large blooms. So, as an alternative to watering the base of the orchid you can actually take a spray bottle and spritz the orchid faces directly. Should I feed by orchid? Definitely yes. Garden centres and nurseries sell a range of orchid food in varying strengths. Visit your local garden centre and talk to their staff about the options available. 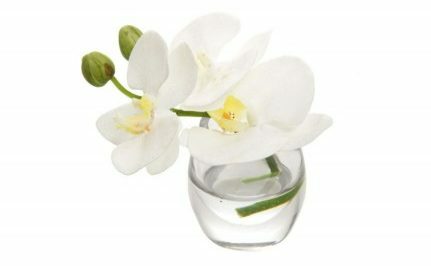 Be sure to get a food specific for orchids, as opposed to a generic plant food. How long do the blooms last? A lot of factors do affect how long an orchid blooms for but, on average, the potted orchids we sell stay in full bloom for up to six months and sometimes much longer. As a general rule, orchids are definitely a ‘you get what you pay for’ purchase. How can I encourage my orchid to re-bloom? Once all the bloom are spent, the orchid stem will begin to dehydrate and turn a dark brown colour. This is how the plant enters dormancy. No, the plant is not dead. During dormancy, nutrients and water are stored in the plant’s leaves until they are needed for growth and blooming. In this phase of the plant life, your orchid will need more food and fertilisation than during its blooming phase (as often as once per week). Dormancy can last between six and ninth months. At the end of its dormancy cycle, you will see a new spike emerge from the plant base.